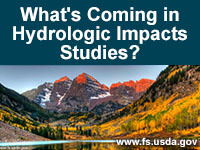 MetEd » Resource Description: What's Coming in Hydrologic Impacts Studies? In this recorded webinar from the Hydrologic Impacts Under Climate Change (HIUCC) course (June 2017), Dr. Julie Vano describes what the near future will likely bring in terms of hydrologic impacts studies. Her talk is parsed into four sections. Section 1 summarizes ongoing research. Section 2 discusses the sharing of hydro-climate information. Section 3 moves into the future and describes the process of planning, executing, and evaluation a climate impacts study. Section 4 provides concluding thoughts from Dr. Vano and includes three questions (and answers) from the HIUCC course attendees. I did not find the questions I could have checked to be obvious, but this was my first exposure to the study. This is a wrap-up lecture and discussion for a class/workshop. As a standalone module, it refers heavily to material that is not (yet?) available on MetEd so a lot of context is missing. The lecture does raise interesting points and point to many references. these video's have a black rectangle on both sides of'em even on full screen mode. they should be fit to screen and there not. Also, I had to wait awhile for these videos to buffer. My play sometimes "caught up" to the downloading video. Identify what types of data and practices would be useful for a climate change impacts study. List three advantages of using the ICAR model over the use of the statistically downscaled output from a general circulation model (GCM). Describe three factors to consider in order to use climate and hydrology models effectively. Explain the advantages of using multiple model projections to capture the range of possibilities. Describe the potential advantages and limitations of using high resolution models. Identify the first step in planning and executing a climate change impacts studList a few important elements of a climate impacts study that are influenced by the climate question of interest. Interpret a graphical depiction from a climate change impacts study.